Home » alternative medicine » cranberries » cranberry juice » fall » Heart » heart health » prevention » produce » studies » urinary tract infection » Cranberries Have Role in Heart Health, Should We Give Thanks? 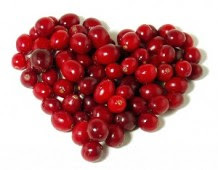 Cranberries Have Role in Heart Health, Should We Give Thanks? Several studies, including new research presented at the Cranberry Health Research Conference, suggest cranberries may play an important part in heart health. As we prepare for the Thanksgiving holiday and the height of cranberry season, it’s time to explore how these red berries may benefit heart health. The current study follows several previous efforts to determine whether cranberries should be considered heart-healthy and worthy of attention beyond the role they have played for years. That role has focused on their ability to help prevent urinary tract infections, particularly in women who are susceptible to this common condition. Before we get to the latest research, let’s look briefly at what preceded it, beginning with a Tufts University study published in 2007. The authors of that review noted there was evidence to suggest that the polyphenols found in cranberries may reduce the risk of cardiovascular disease by hindering the accumulation of platelets and reducing blood pressure. In a 2011 study, a team at Boston University School of Medicine examined the effects of cranberry juice on vascular function in individuals who had coronary artery disease. Two studies were conducted: an acute, no-placebo pilot that involved 15 patients, and a chronic, placebo-controlled crossover study that enrolled 44 patients. In the chronic crossover study, the individuals were randomly assigned to drink 16 ounces daily of cranberry juice or placebo for four weeks. The participants in the acute study consumed 16 ounces of cranberry juice one time only. In a subsequent (2013) double-blind, randomized study, the authors set out to see whether daily consumption of double-strength cranberry juice over four months would have a beneficial impact on vascular function and endothelial cells (which line the walls of the arteries). A total of 69 men and women who had peripheral endothelial dysfunction and cardiovascular risk factors participated in the study and completed it. The authors found that drinking the cranberry juice may protect against atherosclerosis by reducing the number of endothelial cells that make a compound called osteocalcin, which has been linked to hardening of the arteries. In this latest study, the authors enrolled 10 healthy males (age 18-40) and evaluated the immediate impact on vascular health after they consumed 16 ounces of cranberry juice at various concentrations, ranging from 0 to 117 percent, including 25 percent, which is the concentration commonly found in commercial cranberry juice cocktail. The investigators found that drinking cranberry juice improved (increased) flow-mediated vasodilation, which is a measure of blood flow and vascular health, ranging from 1 to 2.5 percent, depending on the concentration and when the participants were tested. At the highest concentration, there was a 10 mmHg decline in systolic blood pressure as well. The findings of these studies provide some evidence that cranberries may have a role in heart health. Although it may be too early to stock up on cranberry juice (which can contain lots of sugar depending on what you buy), it may be comforting to know that these little red berries may have more potential than helping ward off urinary tract infections. You may want to raise a glass of cranberry juice more often in the future…for heart health.